1 big thing ... Trump on his future DHS head: "He's an Obama guy!" Early on in the January government shutdown, there was a meeting in the White House Situation Room between President Trump, then-Homeland Security Secretary Kirstjen Nielsen, administration staff and congressional leaders from both parties. Nielsen was trying to explain the chaos at the border. House Speaker Nancy Pelosi kept interrupting her, saying she thought the Trump administration was manufacturing the crisis and distorting statistics, according to four sources who were in the room. So Nielsen, visibly frustrated with Pelosi, turned to Kevin McAleenan, then her deputy (last week, Trump gave him her job). He was sitting along the wall with the other staff, behind the main table. Nielsen asked McAleenan to dig into the figures and explain some of the intricacies of the situation. "She was like, 'You don't have to listen to me because I am the president's DHS secretary; listen to the career professional,'" one source recalled. Pelosi interjected that McAleenan was also one of the president's people. 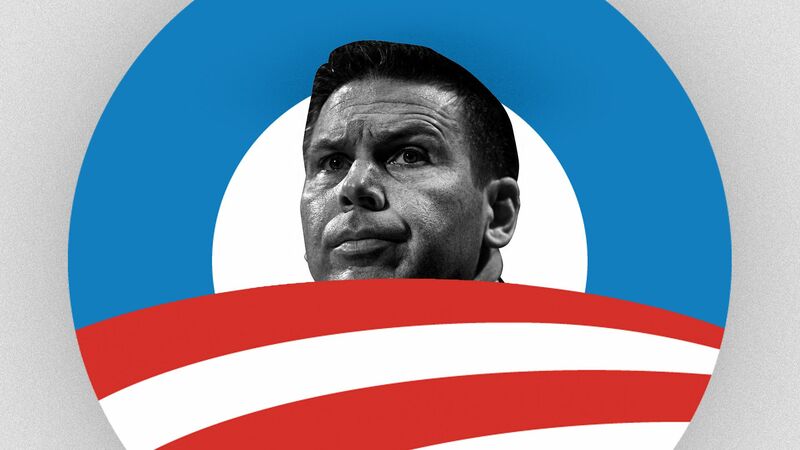 Then Trump said of McAleenan: "He's an Obama guy!" McAleenan replied quietly that he was a career guy before becoming a political appointee under Trump. A senior White House official said Trump "was trying to say Kevin has credibility on the issue and worked in another administration." And Pelosi spokesman Drew Hammill responded: "It is a statement of fact that this administration has used false statistics in an effort to support their anti-immigrant policies that are creating a massive humanitarian challenge at the border." Between the lines: It's a bit ironic that Trump's pick to make DHS more aggressive is someone he called "an Obama guy." Much of Washington has spent the weekend on pins and needles preparing for this week's release of the Mueller report. But in one particular quarter, people seem quite relaxed. Behind the scenes: Two of the president's top advisers who will be handling the response to Mueller’s report were watching the Masters when I called them about it this weekend. By all accounts, the president himself is also taking a fairly blasé approach. The subject has barely come up, if at all, in recent senior staff meetings, according to two sources with direct knowledge. And in recent calls to aides and allies, Trump has barely mentioned it. Rudy Giuliani, the president's lawyer, told me Trump hasn't seen the report. And senior White House aides have scant details about it, telling me they could only guess when exactly it will come out and how much of it will be redacted. Most expect Attorney General Bill Barr to release the report mid-week. "You're looking at it and determining what is the political optic of it; it's not a legal optic here, it's political," one of the president's advisers told me. "Until we see the report, it's very hard to speculate about what we'll be dealing with mid-week." Another lawyer who has dealt with Mueller's team said, "My guess is, it's probably going to be, when it's put all together by Mueller's team, it's going to look more like obstruction to the casual eye than it might be legally." "I'm also very interested to find out what it is that Mueller said about why he was not going to draw a conclusion" about obstruction, the lawyer said. What's next: The president's outside legal team will not read the report alongside his White House lawyers. Rather, the two groups of attorneys plan to go through it separately. A senior Trump adviser said the two groups will write separate responses — with the outside response likely more aggressive than the White House's institutional response. Giuliani told the Wall Street Journal that Trump's outside lawyers have prepared a counter-report that is currently 140 pages but they're trying to whittle it down to 50 pages. Giuliani told the Journal they expect to focus their defense mostly on the topic of obstruction of justice and will largely ignore collusion. "If we've gone from two years of roaring 'indict and impeach' to now a more resigned 'embarrass and harass' the president ... then no wonder many Americans demand answers as to how this all started and who was involved," Kellyanne Conway told me, foreshadowing what we are likely to hear from Trump's top aides this week. Another source involved in Trump's response told me they haven't decided what they will release in response to the Mueller report. "We have multiple documents," the source said. "No decision on release until we know what we are responding to. May not release anything." In a closed-door meeting with members of the Senate Foreign Relations Committee last month, King Abdullah II of Jordan said the White House had given him zero visibility into the most fraught part of their peace plan: how it proposes to divide Israeli and Palestinian territory. The king seemed dissatisfied with the level of consultation and was pessimistic about the plan's prospects, two sources in the room told me and Alayna Treene. And my colleague Barak Ravid reports that King Abdullah has privately told people he is frustrated by the fact that despite having numerous meetings with senior Trump administration officials, he's never been given any detail about the core political issues, in which Jordan has a huge interest. Any U.S. peace plan between the Israelis and Palestinians will also impact Jordan, which borders the West Bank, has a majority Palestinian population and has a special status in Jerusalem's holy sites according to the 1994 Israel-Jordan peace treaty. The sources who were in the room with King Abdullah told me and Alayna that he meets with the committee almost every time he's in D.C., and he usually speaks with caution. But he seemed less so this time, a source in the room said. "The king made it clear they have not been talking to him about it. He seemed to be critical and dismissive of the efforts," one of the sources said. Another source in the room said King Abdullah "gave the impression that it was more of an economic deal rather than a peace deal." A Jordanian official with knowledge of the discussion told Axios: "His Majesty was asked about the plan and said he did not yet see it and therefore cannot comment. He also believes that an economic plan without a political one is not sufficient." A senior White House official responded: "We have met and spoken with leaders throughout the region, including King Abdullah, to share ideas and solicit their thoughts." "Since the beginning, we have been clear that this is not just an economic plan. We are taking very seriously both aspects of this, the political, which deals with all the core issues, and the economic. We understand that if the political aspect does not work, the economic aspect will not create peace." "But at the same time, the political aspect will not succeed without a significant economic plan to enhance Palestinian lives and the lives of others in the region." Behind the scenes: Sources with direct knowledge tell Axios that only five or six people in the entire U.S. government have seen the political side of the plan, making it one of few secrets the White House has been able to keep. During Jared Kushner's recent tour of the region, he briefed Arab leaders on the economic side of the plan, but revealed nothing about the proposed division of land, the status of Jerusalem or whether the plan would support the creation of a Palestinian state. Why it matters: The White House's Arab partners who will need to sell a peace deal remain in the dark about its political dimensions. These Arab partners — including the Saudis and Emiratis — have also complained that the Trump administration has taken steps favoring the Israelis and frustrating the Arab world, including moving the U.S. Embassy to Jerusalem and recognizing Israeli sovereignty over the Golan Heights. What's next: The White House peace plan isn't expected to be public before mid-June, and it's unclear if the White House will reveal the whole thing at once. Some on the team, according to sources in touch with them, hope to roll out the economic side first. Iran's economy has been in free-fall since President Trump withdrew the U.S. from the Iran nuclear deal and reimposed strict sanctions on its government. And the administration's unprecedented move on Monday designating the Islamic Revolutionary Guard Corps (IRGC) as a foreign terrorist organization is expected to further damage its economy, Alayna writes. The International Monetary Fund forecast an even deeper recession for Iran in its World Economic Outlook, released Tuesday. The IMF said it now expects Iran's economy to contract by 6% this year, compared to October's prediction of a 3.6% drop. The World Bank predicted in an April report that the Iranian economy would "contract sharply," and it expects GDP to shrink by 3.8% in 2019 on the back of U.S. sanctions. The big picture: "Our sanctions have denied the regime many billions in revenue that it would otherwise spend on terrorism, missile proliferation, and proxies,” said Brian Hook, who helms Iran policy at the State Department. “The positive effects are increasingly visible. We will continue to use all the tools at our disposal to press the regime to change its destructive policies." Yes, but: Iran's leaders have shown no signs, so far, that they're willing to concede an inch to the Americans. Most analysts we've spoken to believe the regime can endure even greater stress than they've suffered to date, noting it outlasted long bouts of dire economic conditions since the early 1980s. "While maximum pressure can cause maximum damage, Tehran's strategy has been to exercise maximum patience," said Behnam Ben Taleblu, a senior fellow at the Foundation for Defense of Democracies. "Iran is in dire straits, but they may not mind suffering a little longer if they think their suffering could soon be vindicated." "This kind of recession developing countries can handle," said Djavad Salehi-Isfahani of the Brookings Institution. "In terms of economic collapse, that is not on the horizon. But increased poverty, lower income, higher unemployment? Yes, those things are probably going to happen in the next 12 months. ... My prediction is they will try to weather it." What's next: The administration faces a major decision next month. After withdrawing from the nuclear deal, the Trump administration let eight countries keep buying Iranian oil without facing U.S. sanctions. On May 2, the administration will have to decide whether to keep those waivers in place. The House and Senate break for a two-week Easter recess. Tuesday: Trump has lunch with Vice President Mike Pence. Wednesday: Trump will speak at the Opportunity Zone Conference with state, local, tribal, and community leaders. Thursday: The President and first lady will participate in the Wounded Warrior Project Soldier Ride. Trump will also meet with Secretary of State Mike Pompeo. Ivanka Trump is in Africa with USAID administrator Mark Green for a "women's economic empowerment summit" with West African leaders in the Ivory Coast, and a "women's economic dialogue at the Africa Union in Ethiopia," per a White House aide. They are there to promote the United States' Women's Global Development and Prosperity (W-GDP) initiative.